So many people loved the dried orange slice garland project, so I thought I’d make some whole dried citrus ornaments to decorate the house this Christmas. This took a little trial and error, but in the end, they turned out really nice. I tried lemons, limes, oranges, and clementines. The orange and clementines worked out the best, so I made several clementines to dress up an old berry garland in the kitchen. For this project, you will need a garnishing tool to carve sections of peel from the fruit. You can easily pick one up at any major grocery or retailer for less than $10. Simply peel away the rind, starting at the top, and move to the bottom. You can also make a spiral shape. When you are done you need to let them air dry for about two weeks, depending on the humidity in your home. The first time I made them, I placed some in a wicker basket, (above) and they got all moldy. Yuck. However, these hanging in a wire basket worked great. I also tried sticking them in the oven. See the group on the right. Not a good look. Finally, I just used a wire rack and made sure they were in a nice dry area of the house. To hang or attach the dried clementines, take an ordinary wire hanger, leave one end hooked, and straighten out the other end. Pierce the clementine with the straight end, and let the hooked end slide into the bottom and act as an anchor. Now you can attach the fruit to your tree, or any other spots such as wreaths or garlands. Here’s an orange I dried too. I used an eye screw and some ribbon for this larger ornament. For the clementines, I took an old artificial berry garland and wrapped it around the light in my kitchen. 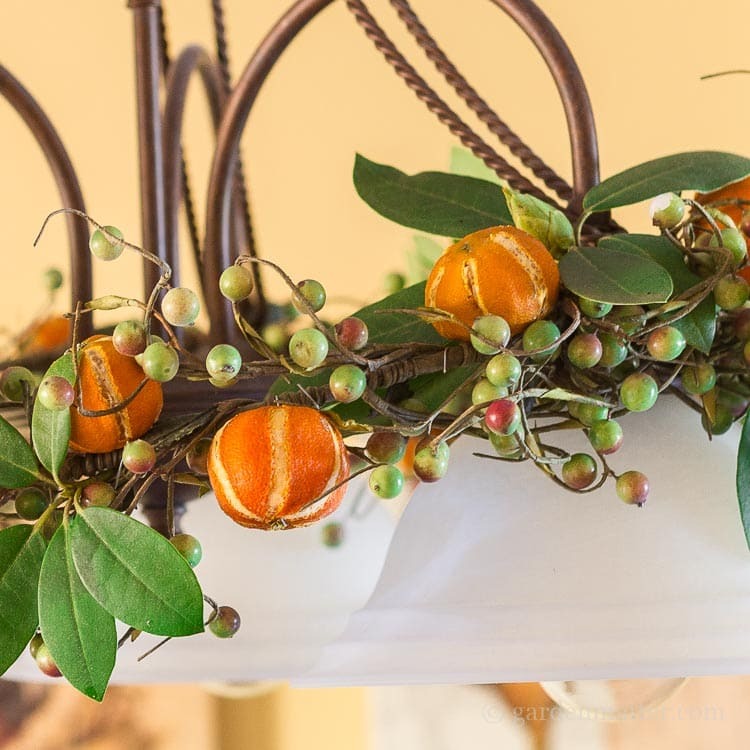 The clementines can easily be attached to the garland with their wire hangers. A few sprigs of rhododendron leaves add a little extra fresh look. It turned out great, and I think this idea would work well for all kinds of special occasions. For now, it will be part of our Christmas decor. I love these! I usually dry fruit slices for my garlands. The only question I have is how long did it take them to dry out? Jenny, they took a good two weeks. It probably depends on the temperature and humidity of your home, so maybe a little more or less. Make sure they have good airflow. Hope that helps. If you wanted to add some whole cloves, would you do it before or after drying the citris? I’m really not sure. After I read your comment I tried a couple in one that was already dried. I poked a hole first with a pin and the cloves went in easily. Here’s a pic. Thanks for sharing on Funtastic Friday! Another gorgeous project, Patti! I even have one of those garish tools somewhere in the depths of my kitchen drawer! Pinned and sharing! Thank you for joining us at Family Joy Blog Link-Up Party. Patti that is so beautiful and such a cool idea. i have a whole bunch of orange trees, I can easily do this if I don’t mold them. And this can be up the whole winter. It is such a pretty idea. So glad you like it. Once I made sure they received plenty of air all around I had no problems with molding. Enjoy. This is so pretty, moldy oranges aside! 😉 I’m sure it smelled very good. Visiting from Pretty Pintastic Party. I love this idea. It would be a nice addition to my dried orange slices. Thanks for sharing on Sunday’s Best linkup. Just beautiful!! You make it look so easy. Thanks for linking up with us at Share the Wealth Sunday! They cam out so pretty!! I love them! Thanks for linking up to Merry Monday! Sharing on G+! Have a great week! Great job on the instructions and photos. One of the better ideas I have seen with drying oranges. I’m saving this post until I move into a larger apartment! Currently in a studio! This project is doable and will come in handy for future decorating adventures! How long can these citrus fruits be saved? I’m thinking just one season. I’m not sure how long they will last certainly through the Christmas season. However, I still have my dried orange slices from last year and they look a little darker but otherwise are doing well. I love this idea! I have done cloved oranges before, but this takes it over the top. Cloved oranges are so pretty too. I’ve been thinking about them for a centerpiece but now I’ll probably just add in some of these guys. Patti, that looks so pretty,añd I bet it smells great to. They do smell nice but the scent is not very strong. I love this project! What a beauty this is, my California daughter needs to be doing this. I love this and citrus is a favorite here especially this time of year. For me decorating for Christmas is all about the natural elements. I love your creativity, gorgeous! I bet you have a lot of citrus in the south and I agree with you that natural is a preferred element in my decor. Although I will say that the artificial products seems to be getting better and better everyday. I love this look, Patti. Growing up so near Florida, citrus was always a part of our Christmas and winter traditions, so this really brings back holiday memories for me. This is so gorgeous and creative. Thank you for sharing. Thanks Karen. It was a fun project to experiment and I am loving how great the clementines are looking in my holiday decor. It did take a good 2 weeks for me to be able to use them so I wanted to get this post out asap in case anyone wanted to try it for themselves.